This is my sixth book review for the Women of Genre Fiction Reading Challenge at Worlds Without End. The problem with trying to write a review of The Thief is that the only thing really worth dissecting is the twist ending, which of course I can’t do without spoiling the whole book. I thought I was going to have the same problem with The Queen of Attolia, that anything I say about it would spoil the first book, but happily that doesn’t seem to be the case. So I’m going to cheat a little on the challenge, and review the second book I’ve read by Megan Whalen Turner. I went into this knowing that the second book was supposed to be much better than the first, but that there’s a really big twist at the end that makes the first book worth reading. I haven’t decided yet whether knowing about The Thief‘s twist made for better reading or not—it certainly made it much easier to guess, but probably lessened the feeling of betrayal on finding out the first person narrator has been concealing things for the whole book. But I wholeheartedly agree that the second book is better, and I actually found it to be more surprising than the first. One thing The Queen of Attolia does that I don’t see often is show believable consequences to trauma. It actually made the book start out rather slow, because after something terrible happens to Eugenides in the opening, he basically spends the first quarter of the book recovering (read: not doing anything). I was actually beginning to wonder if the book had been over-praised. Eventually Gen is knocked out of his funk and the story takes off, but the trauma stays with him. He doesn’t just bounce back unchanged, and I end up feeling so much more connected to him as a character because of it. The other thing I absolutely loved about this book was the complex characterization of the villain. The queen of Attolia does horrible things to Gen, and we hate her for it, but we slowly come to understand why she is so ruthless, and that her actions didn’t only hurt Gen. The surprises in this book were so organic, I don’t think I would even call them twists. Now that Eugenides’s character is firmly established from the first book and a half, it doesn’t feel like a cheat that he would keep his plans to himself, and the contents of those plans–well. I thought they were perfect. As events unfolded in their fullness, I had fun watching the subtext of the key players’ words and actions, and feeling like I was in on the secret. I imagine some less attentive readers, or possibly the middle grade audience it was written for, might not catch the subtler clues, and therefore get a dramatic twist ending, but I didn’t feel like my reading experience was in any way diminished by guessing the ending ahead of time. Oh, and I can’t close the review without at least mentioning the setting, which is an alternate Greece. Totally different from the usual medieval European fantasy setting, and I love the way the gods are woven in and made an integral part of the story. 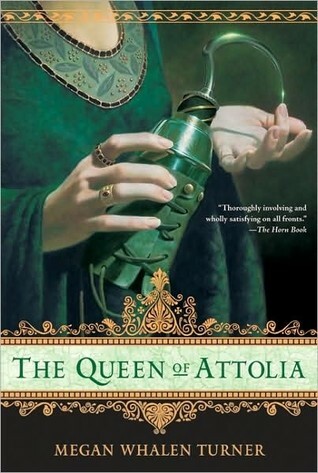 My verdict: The Queen of Attolia by Megan Whalen Turner is absolutely worth reading, and while I wouldn’t recommend The Thief on its own, I believe that reading it first enhanced my reading of The Queen of Attolia. So, go out and read both of them. And then read the next book, too, because I think that might be the best of them all. This entry was posted in Fantasy, Reading, Review and tagged Megan Whalen Turner, WoGF by Emily Sandoval. Bookmark the permalink.